We all inhale grass- and tree pollen, but also excrement of house dust mites when these particles are in the air. When someone is allergic (hay fever or dust mite allergy), this leads to inflammation of the nasal mucosa and emerge the typical respiratory allergy symptoms such as itchy nose, sneezing, nasal congestion, runny nose, constant feeling of cold etc. Often, these symptoms lead to headaches , worse sleep and consequently loss of concentration and fatigue. RhinoBlock® anti-allergy nasal ointment is a nice spreadable nasal ointment made from 100% pure, pharmaceutical manufactured, white soft vaseline and medicinal grade honey and is suitable for all ages. 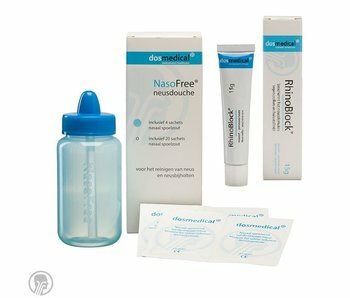 By lubricating RhinoBlock® anti-allergy nasal ointment at the inside of your nose, you put a protective layer over the nasal mucosa. This protective layer prevents the allergens themselves to mass nesting on the nasal mucosa and less allergens in the nasal mucosa means fewer allergy symptoms. The ingredients in RhinoBlock® anti-allergy nasal ointment are known to rarely cause allergic reaction. The pure white vaseline in RhinoBlock® anti-allergy nasal ointment contains protective substances. Medicinal grade honey, among other properties, contain protective and anti-inflammatory properties. Also does medicinal grade honey lead to wound healing. The special properties of medicinal grade honey have been well known within eg ENT Surgery and wound care. RhinoBlock® anti-allergy nose ointment can be used as needed several times a day.